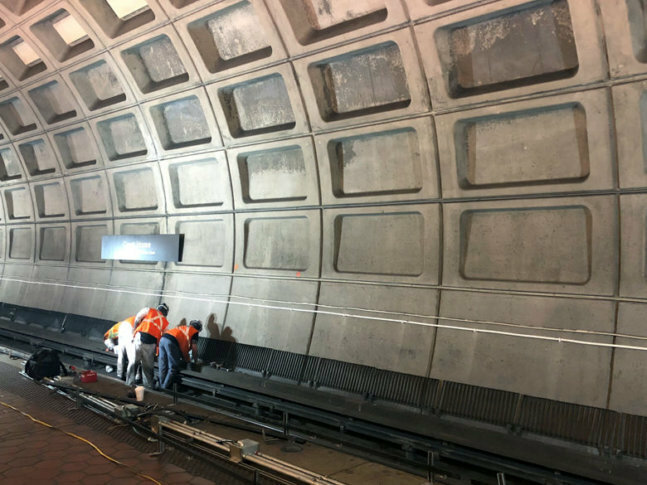 Metro is considering changes to weekend work zones that lead to regular single-tracking disruptions, but that doesn't mean weekend track work will end. WASHINGTON — Metro is considering changes to weekend work zones that lead to regular single-tracking disruptions. Laura Mason, who takes over next week as acting assistant general manager for rail, has been tasked with reviewing track work planning, General Manager Paul Wiedefeld said Thursday. “I need you [to] really think through how we do the maintenance work. You’re not going to pull back from that, but are there other ways you can get to the same place?” Wiedefeld said he told her on Wednesday. Mason is replacing Andy Off who is leaving for the private sector. She had been leading Metro’s major track work planning and coordination since she was hired to stabilize round-the-clock work zone planning in 2016. Wiedefeld hopes getting some fresh eyes on internal reports that have suggested less single-tracking and more shutdowns to reduce the number of riders impacted by delays and improved track work efficiency could help find some opportunities for changes to make Metro a better ride on weekends. For example … if two stations are closed, trains can run close to normally on other parts of a line rather than delays along the entire stretch when trains single-track and no additional service is added elsewhere. “She will get back to me, [and] if there’s other things we can do on the weekend service we will definitely do that,” Wiedefeld said. It does not mean weekend track work will end though. To account for that and the associated long-term ridership decline on nights and weekends when even scheduled waits can frequently top 20 minutes, Wiedefeld has proposed a flat $2 weekend rail fare starting next summer. As of Thursday, he did not have details on whether that fare would include free or discounted transfers to and from buses. “The bigger issue there is how do we start to recognize the pressure we’re under on weekends in terms of the requirements we need to keep the system the way we want to get it to be versus the impact it’s having on customers, so we’re trying to find some way to start to address that issue,” Wiedefeld said. Arlington County and Metro Board member Christian Dorsey is not convinced the $2 flat fare will draw many riders back to the system on weekends if there are still long or inconsistent waits for trains. “I’d really like to see the business case for what was included and also some commentary on what was excluded,” he said after Wiedefeld presented the outline of a budget proposal for the year starting next July. Under the proposal, there could be some service increases if the region pays more. Those include extended Yellow Line service to Greenbelt to make up for cuts implemented two years ago, all Red Line trains running between Shady Grove and Glenmont to eliminate the other location trains regularly turn back in the middle of the line, and some extended periods of rush-hour-level rail service. “Just common sense says if you provide a better product that people will want that product more,” Wiedefeld said. The proposal did not address bus route changes, but did suggest some additional discounts on bus passes. Wiedefeld said there could be individual bus route changes proposed as part of the full budget due to be considered over the next few months, but there will be no major overhaul of the bus system until after Metro’s larger Bus Transformation Project study is completed.